I am going through a major face mask obsession at the moment. I must own one of every mask Sephora carries! Going through them one by one, I am finding a lot that I love, and a few that I would not purchase again. I will keep you updated on my face mask journey, starting with the Sephora Pore Clarifying Mask. I was actually really looking forward to trying out Sephora's Pore Clarifying Mask. Others that I have tried have been absolutely lovely, so I thought this would fit right in. I was immediately attracted to it because it comes in individual packs, easy for travel! (This one made it's way all the way our to Maui with me!!) That's about where the positives stop. As a young teen, I remember having this Nivea face cleanser/mask (Came in a blue plastic pot? remember?). It had this strange silky texture and burned my face when I used it. 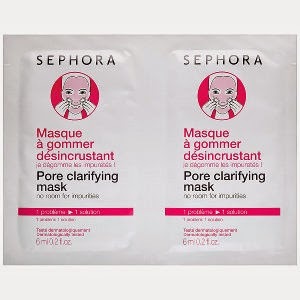 The Sephora Pore Clarifying Mask instantly pulled me into a memory of being 14 and absolutely hating the way it felt on my face. Even worse was the smell. It had the exact same burning, unpleasant smell! I expected something lovely and thick, perhaps even a little muddy in texture. (I find that Sephora's brand has some fantastic products!) This was a 100% no for me. It didn't really clear my pores either. I have normal skin, mostly, but everyone could use a good pore-clearing every once in a while. The Sephora Pore Clarifying Mask was definitely not a win, and I wouldn't purchase it again. Available at Sephora - $6/packet of two masks.